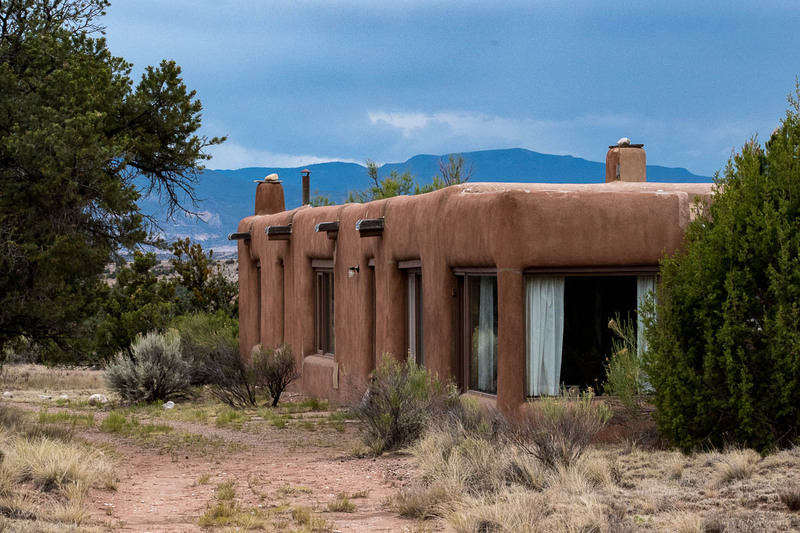 The Georgia O’Keeffe houses in both Abiquiu and Ghost Ranch offer a look into the private life of the artist. 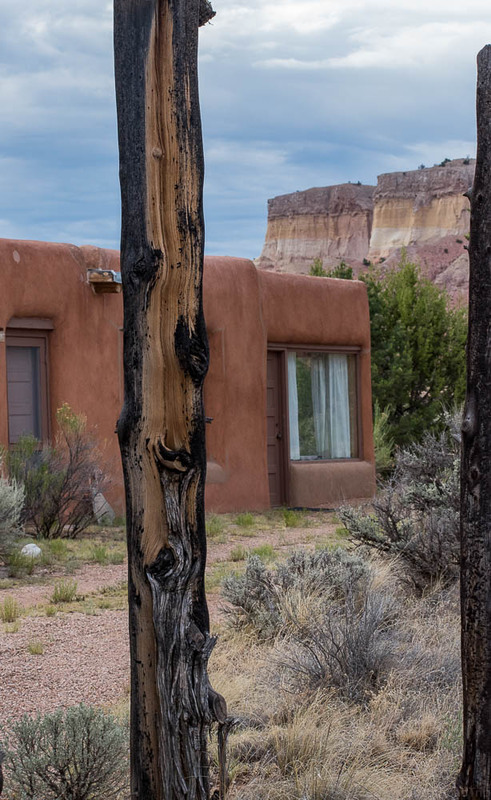 The O’Keeffe house in Abiquiu is open for tours; the Ghost Ranch house is not. 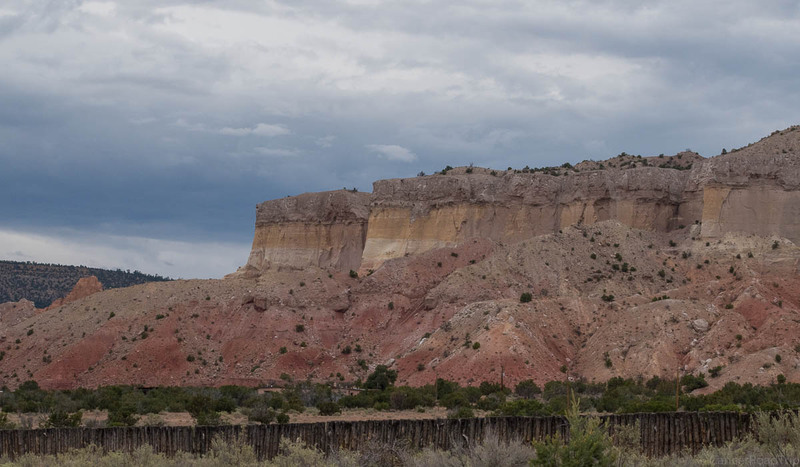 But as serendipity would have it, I was able to visit the property and home of Georgia O’Keeffe at Ghost Ranch. 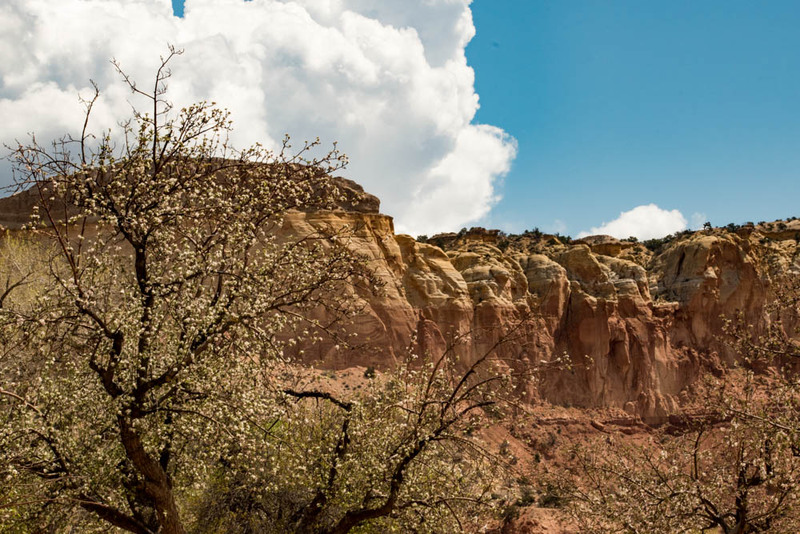 These photos (in the slider above) are from the Ghost Ranch house and some of the vistas that O’Keeffe made famous. There are a lot of photos; but then there is a lot of history. 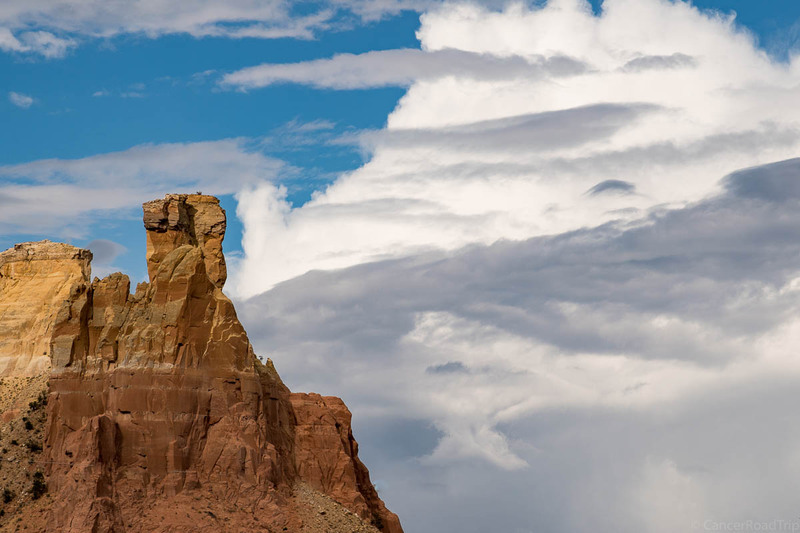 Georgia O’Keeffe left a mark on her times. Her independent nature, her defying the norms of the day and her sense of adventure set her clearly apart. 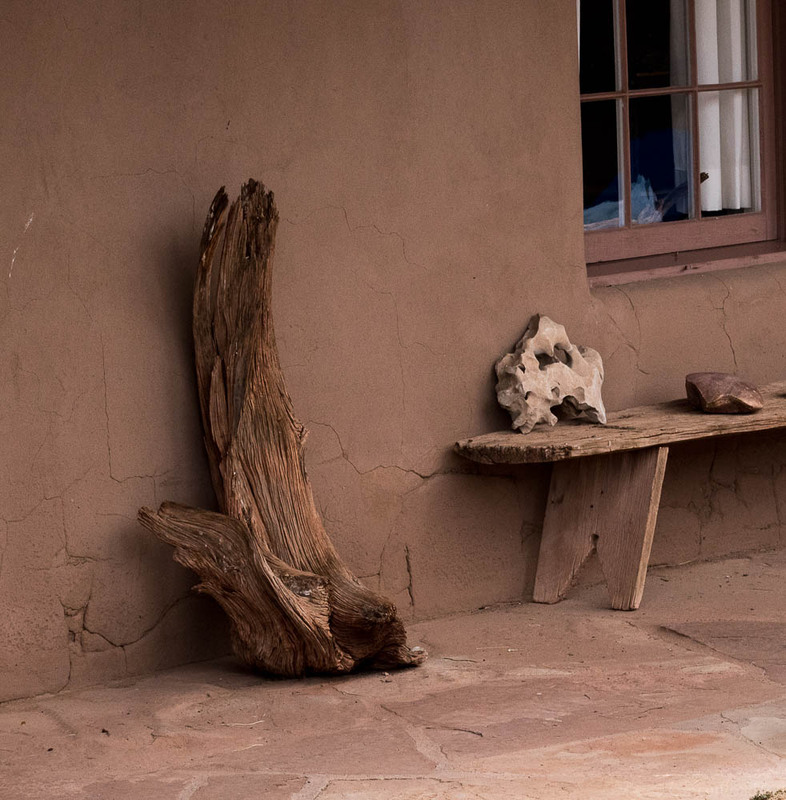 O’Keeffe was something of a recluse and certainly her Ghost Ranch house echoes this aspect of her personality. 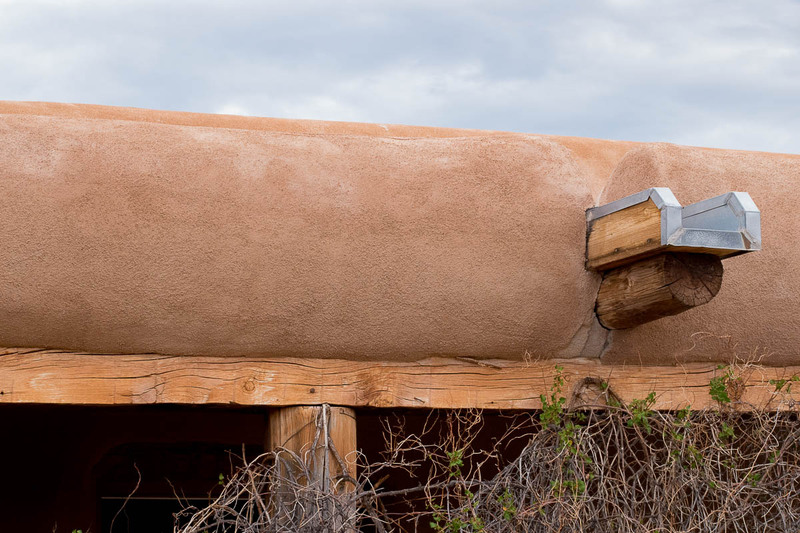 While both houses are molded of adobe, there is a softness to the home in Abiquiu that is missing from Ghost Ranch. 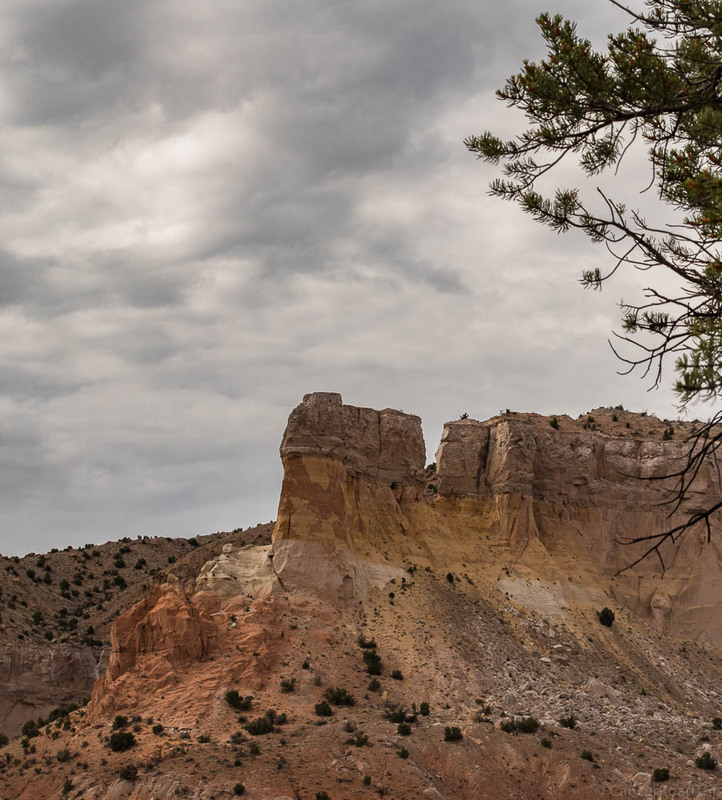 Ghost Ranch is stark; it is remote; it is elemental, although it has all the necessities of a home. 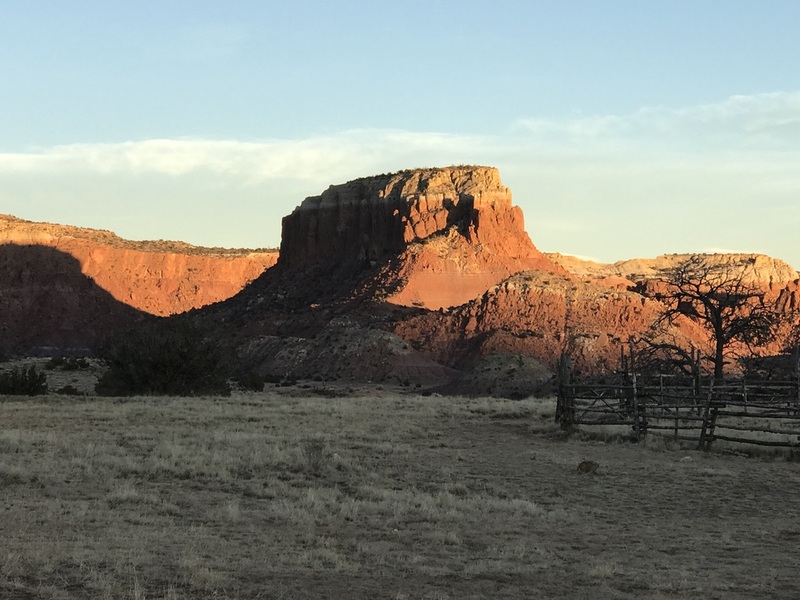 There is a leap to be made, between the harsh realities of remote, high desert living and the paintings of Georgia O’Keeffe. 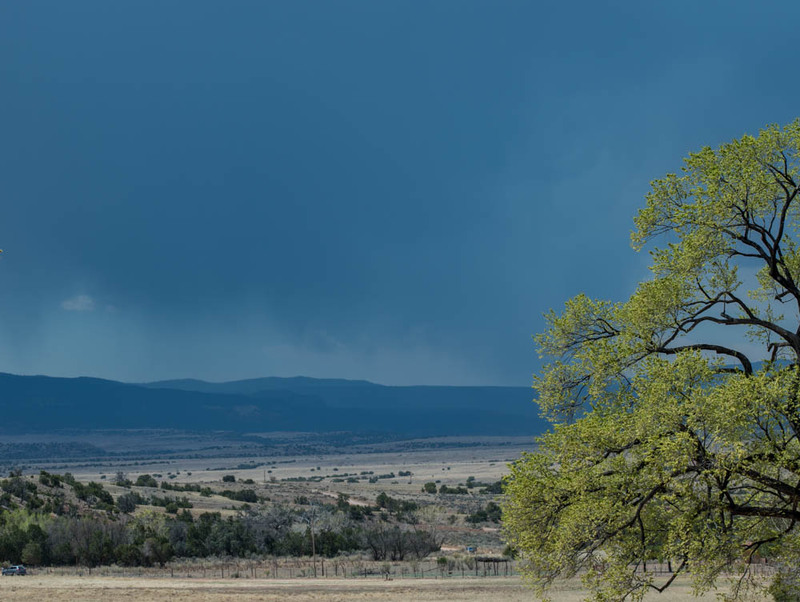 High desert living in northern New Mexico means hot summers under relentless sun; cold snowy winters; wind and rain. 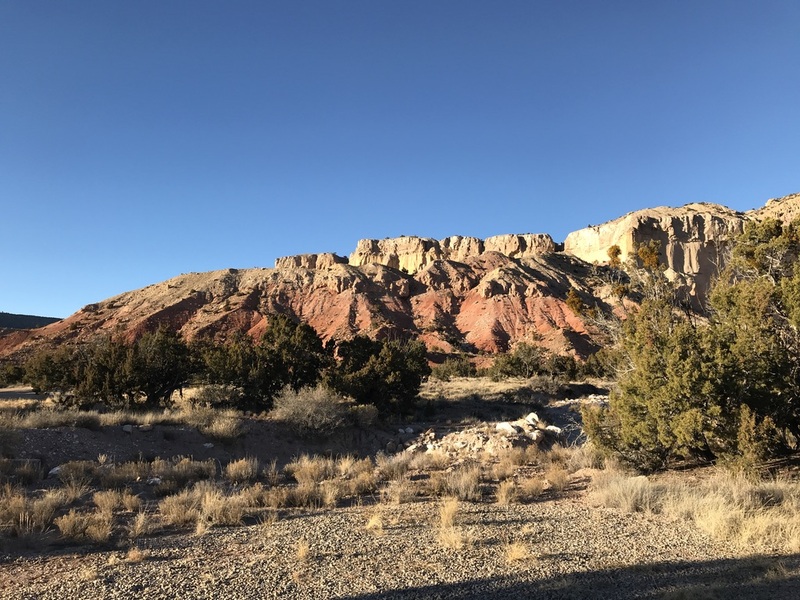 The imagination and talent required to transform this house, its environs and this landscape into beautiful, transformative art is nothing short of stunning. Georgia O’Keeffe originally bought this house on seven acres–named Rancho de los Burros– from Arthur Pack, the owner of Ghost Ranch at the time. 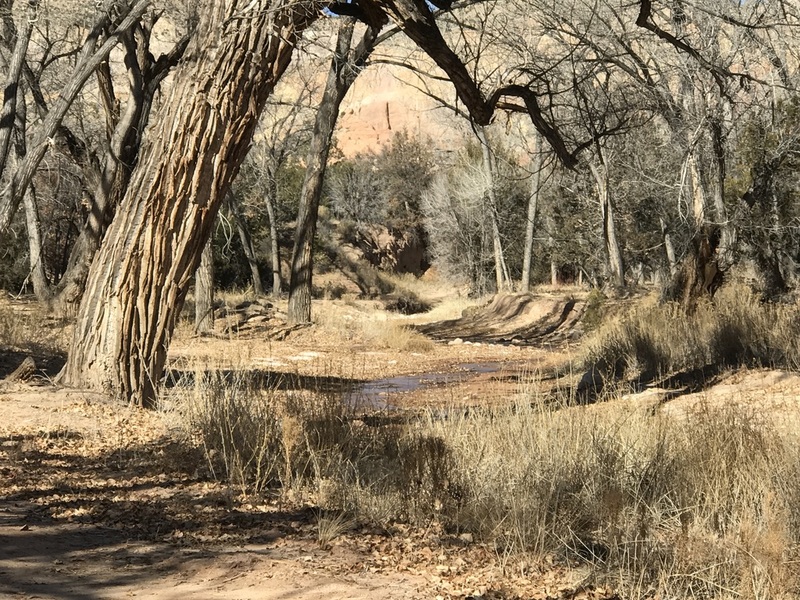 But a house with a garden had caught her eye in Abiquiu. 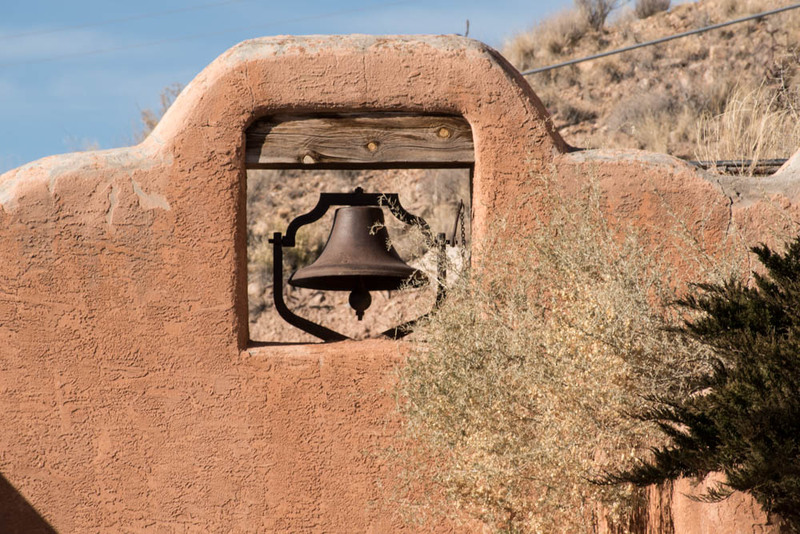 Alas, the Abiquiu house was owned by the Archdiocese of the Roman Catholic Church in Santa Fe and was not for sale. 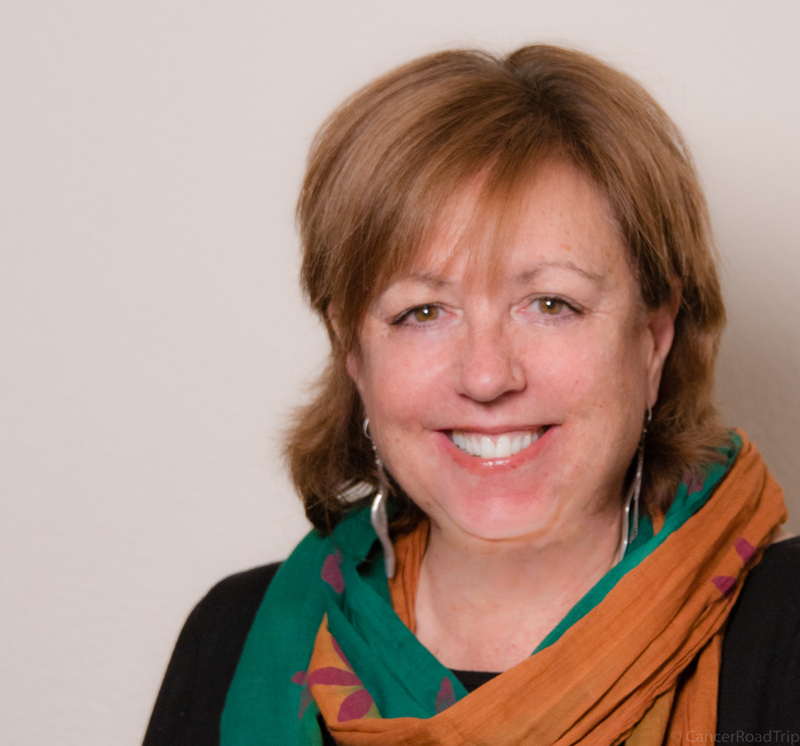 It would take her 15 years to convince the Catholic Church to sell her the property, then another four to renovate it. Meanwhile Georgia O’Keeffe settled into Ghost Ranch. 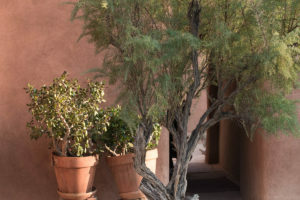 O’Keeffe’s two houses are similar, but different. 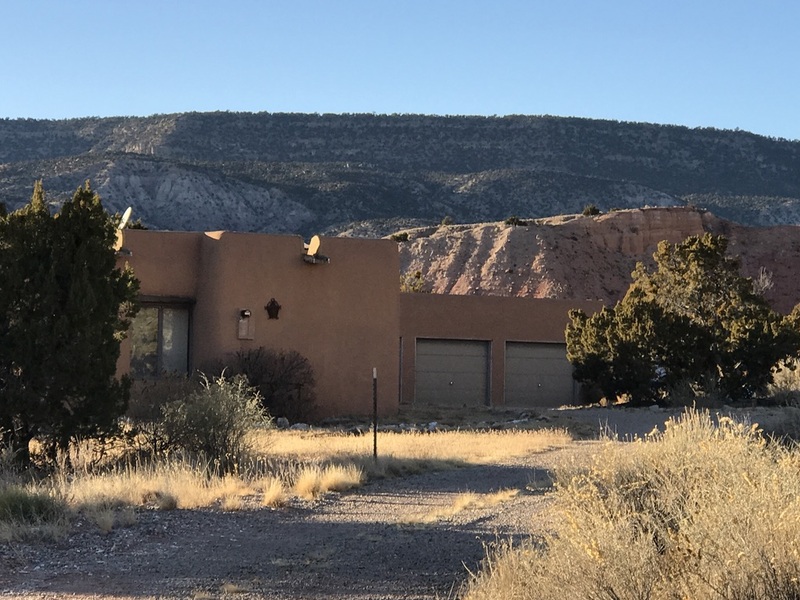 The O’Keeffe house in Abiquiu –the “town house” if you will–is better furnished, more comfortable and while minimalistic, much more refined. The Ghost Ranch house, on the other hand, is a house with a rattlesnake fence and a minimally equipped kitchen. 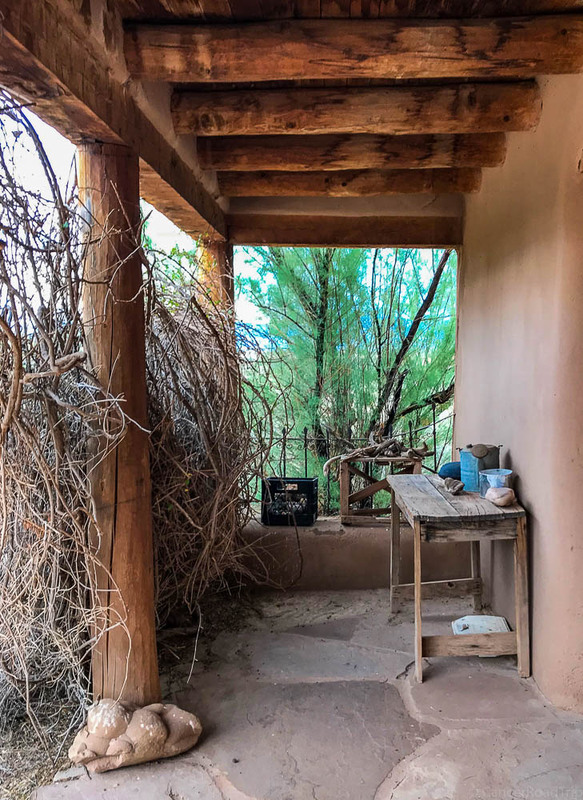 The kitchen may be minimal in part because she took some meals at the dining hall that was part of the dude ranch; it may be because her staff supplied her with fresh food from the Abiquiu house garden once it was up and running. 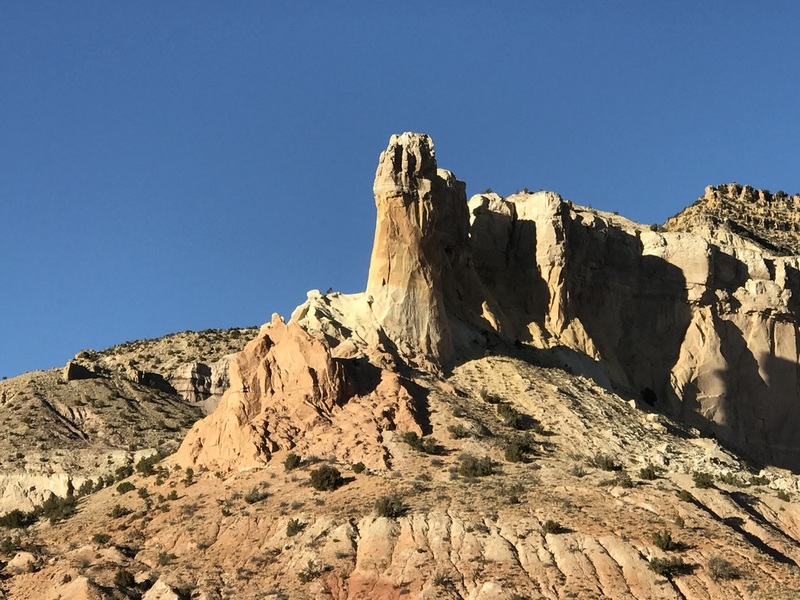 But even after the Abiquiu house was finished, Ms. O’Keeffe would return to Ghost Ranch during the summer to hike, to explore and to paint. 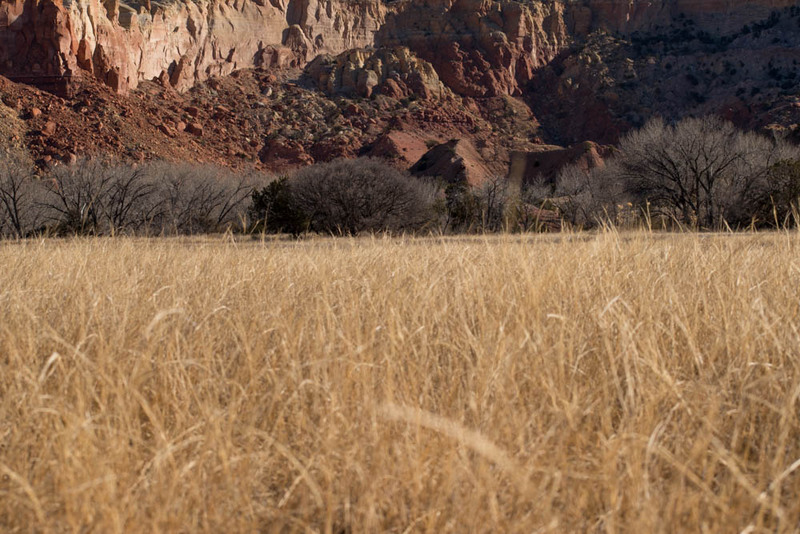 Ghost Ranch would be forever in her art and in her soul. 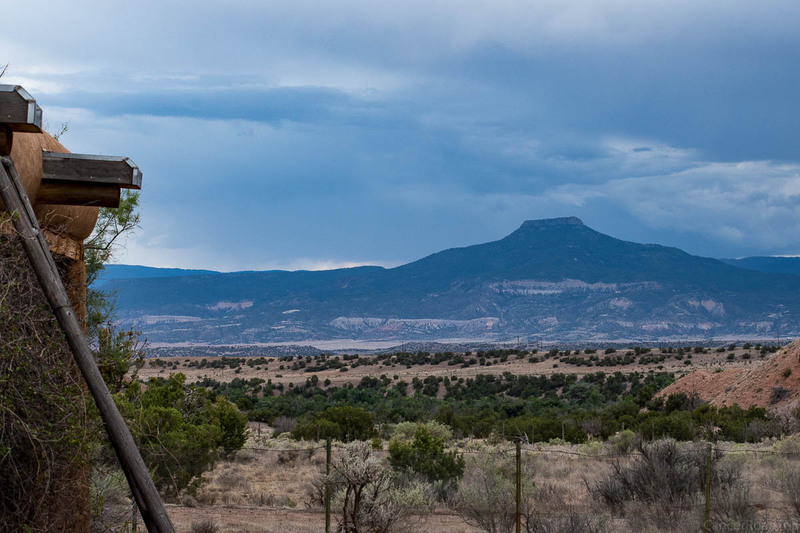 The O’Keeffe house at Ghost Ranch is set away from the dude ranch on its own seven acres. 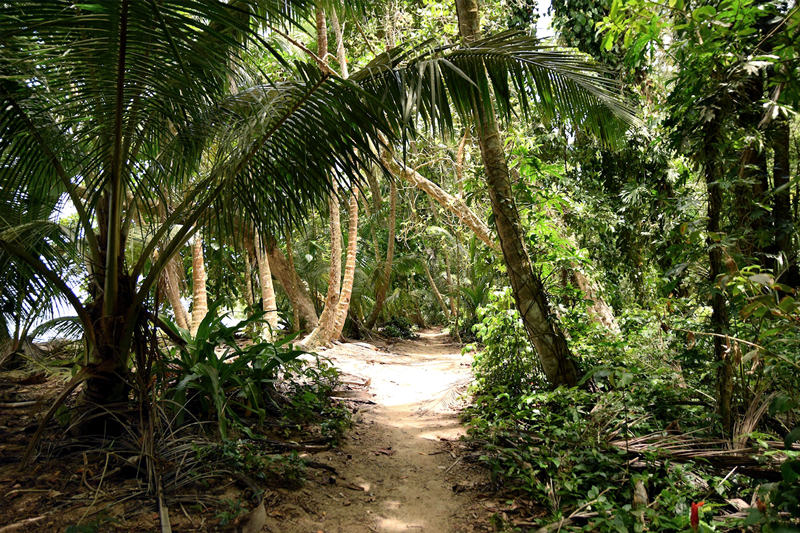 It was here that she painted some of her most famous pieces based on the environment around her. 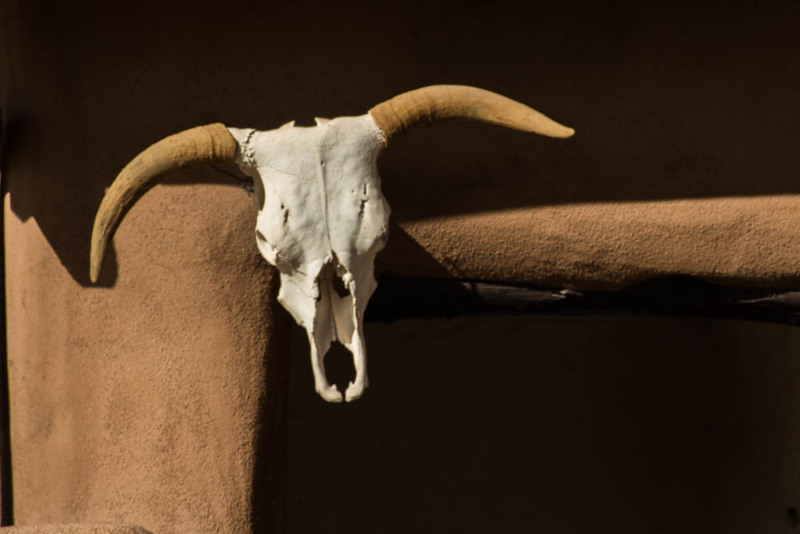 Quirky assortments of wood, bones, rocks and skulls scavenged from the nearby desert adorn the adobe shelves, and the benches and tables throughout the property. The iconic skull, along with these bits of wood and stone appear again and again, inside and outside the house. 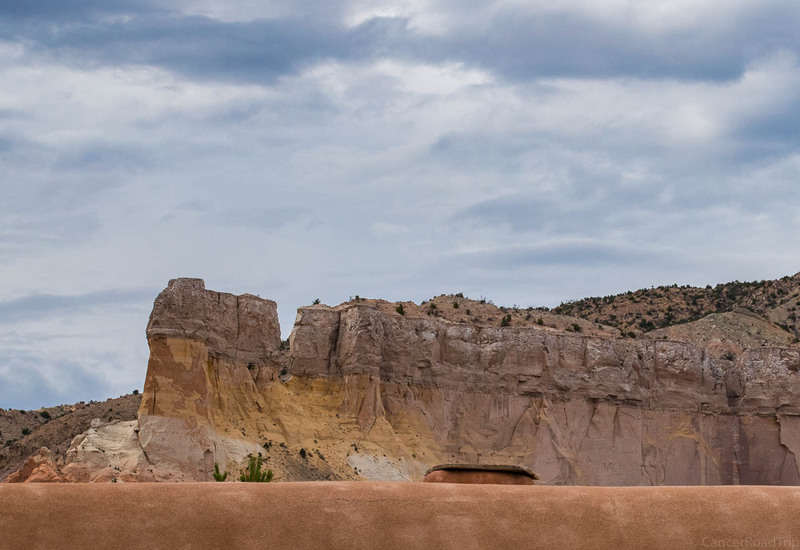 Under the portico at the Georgia O’Keeffe house at Ghost Ranch, then. 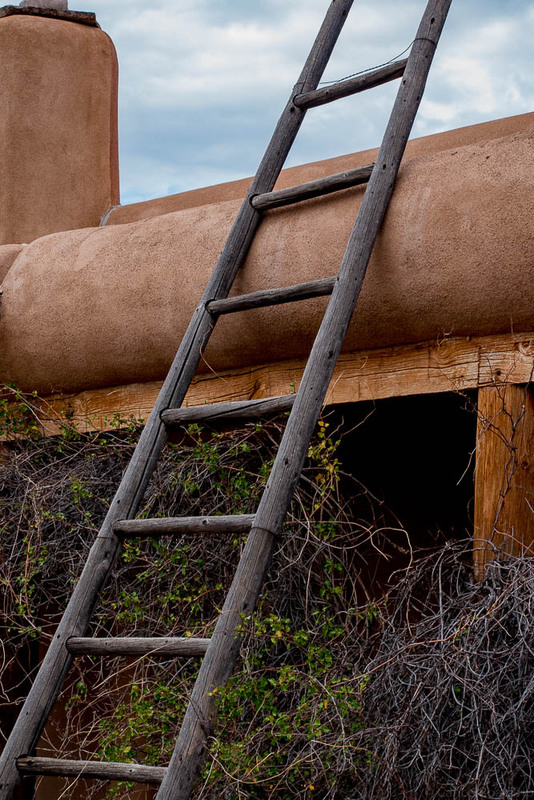 Her iconic style is also found in the simple ladder that lies against the adobe house. 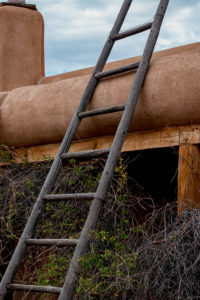 The ladder, leading to the roof, provided a place to sleep in the hot summers (well away from rattlesnakes) and to enjoy the remarkable night skies. It also became a subject for painting. 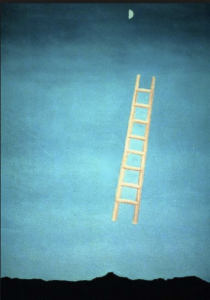 One of O’Keeffe’s paintings of the ladder in her courtyard. And her personal presentation certainly falls within the realm of iconic. She is often photographed in a simple and stark black dress. Somehow the stark simplicity of her dress contrasts dramatically with the rich, bold colors and soft lines of her painting. 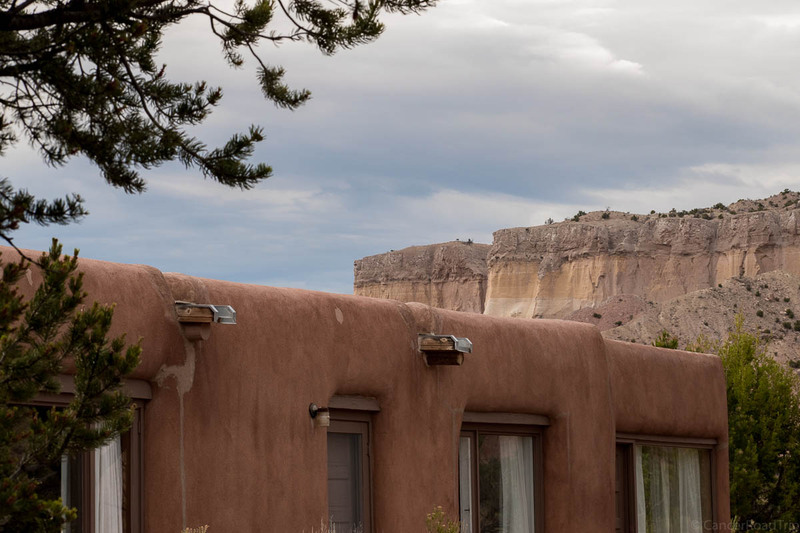 There is a timelessness to Georgia O’Keeffe, as there is to the Ghost Ranch house. Not much has changed in the decades since her death. 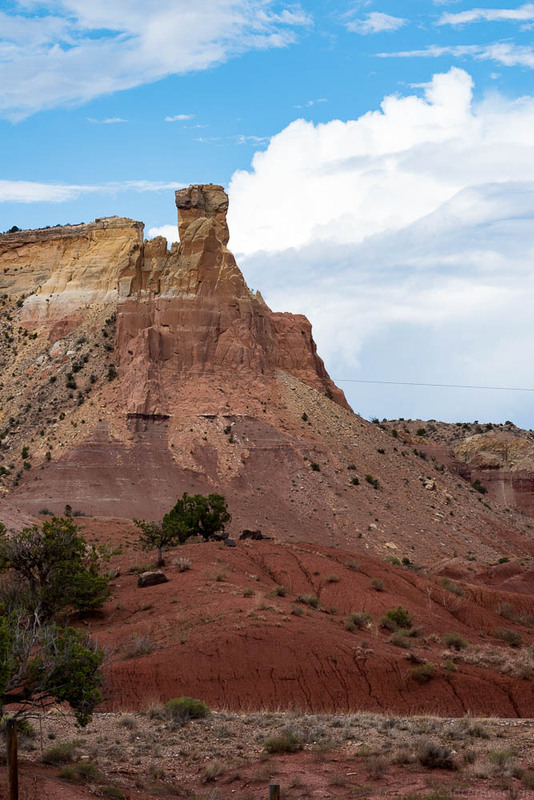 Ghost Ranch endures, as do the amazing views she immortalized through her art. Georgia O’Keeffe House, Ghost Ranch. The courtyard view in Georgia O’Keeffe’s day. 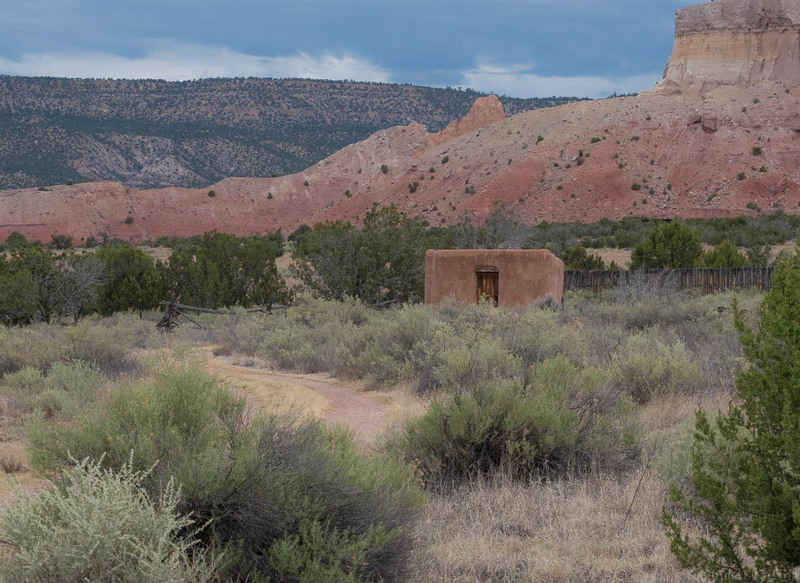 The Ghost Ranch house is in the shape of a U, enclosed on three sides, with the open courtyard looking out towards the Cerro Pedernal. 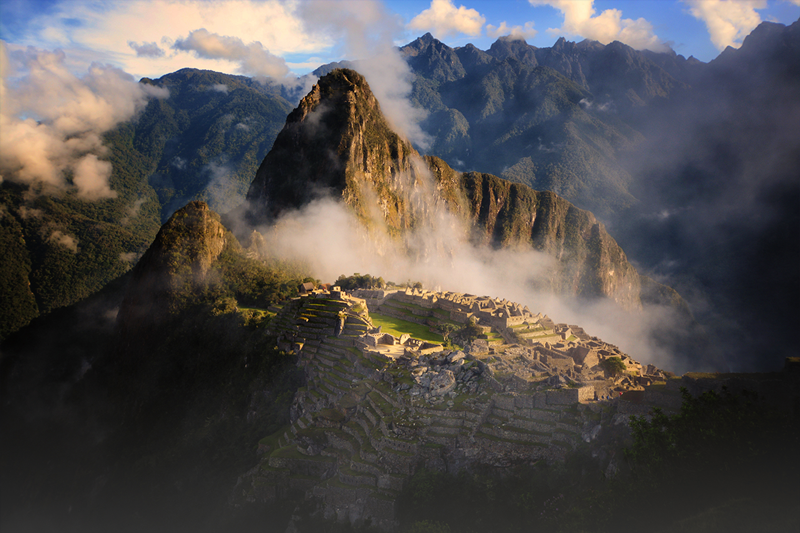 From this courtyard, the landmark dominates the view. 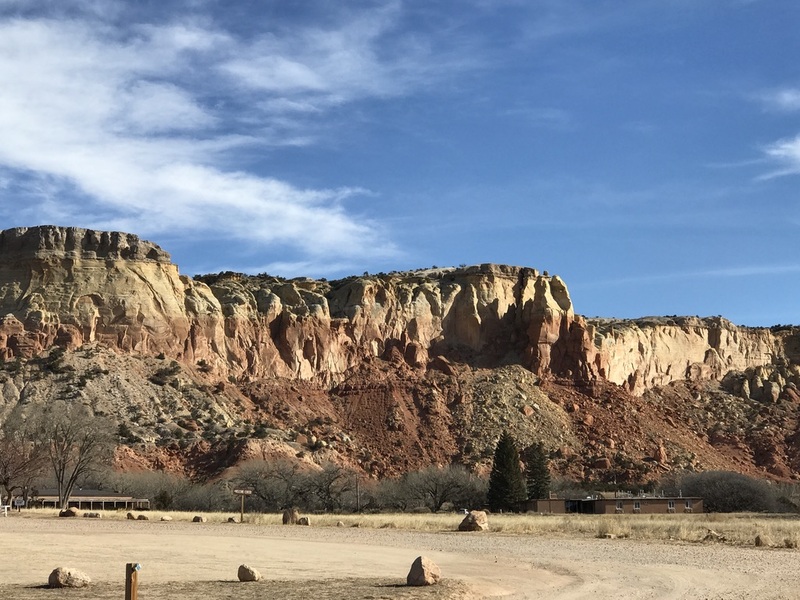 From the courtyard of the O’Keeffe house at Ghost Ranch, view of the Pedernal (today). 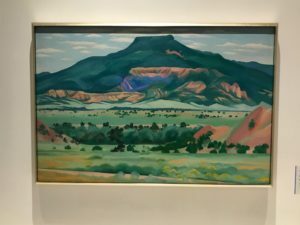 From the Georgia O’Keefe Museum in Santa Fe, a painting of the pedernal from the courtyard of the O’Keeffe house in Ghost Ranch. And closing off the courtyard is a very serious rattlesnake fence. Because rattlesnakes are a serious consideration out here in the wilderness. Barbed wire fencing lines the western edge of the O’Keefe house in Ghost Ranch, to keep the rattlesnakes out. 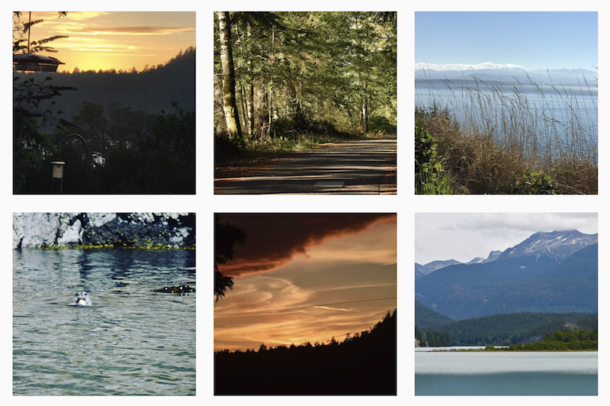 And the views are breath taking at each and every turn. 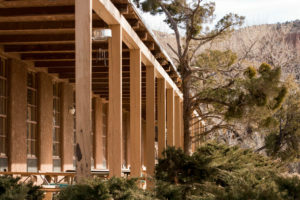 Inside, the house is minimalistic. No rugs; simple furniture; no frills of any sort. Decor is provided by scavenged items from the land. 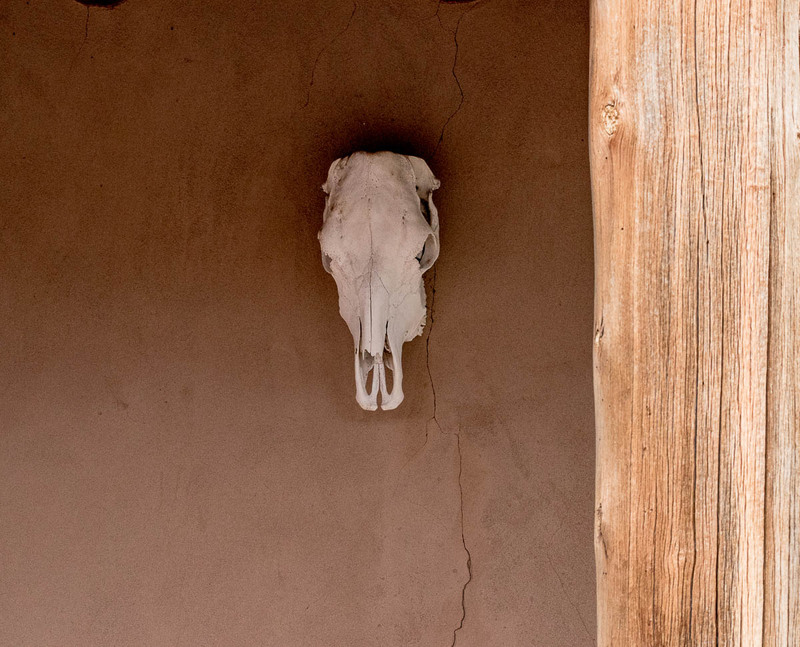 A skull hangs in one room. 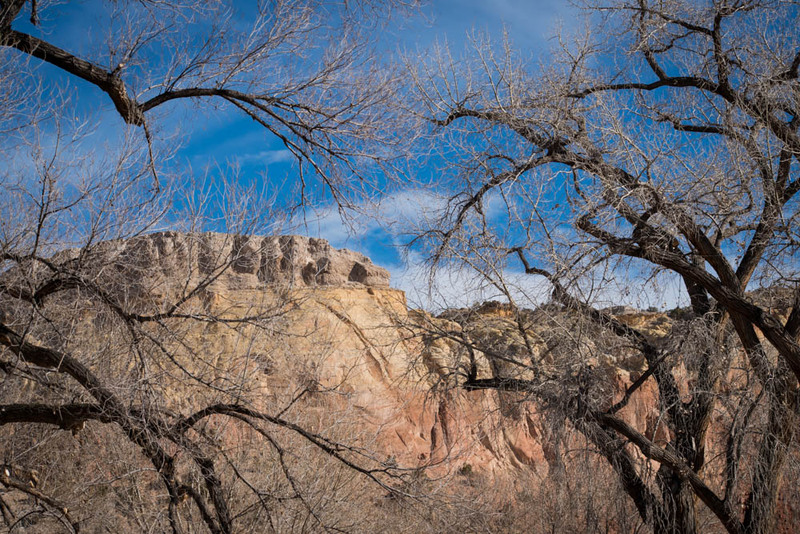 Other than that, the walls are plain; the “art” provided by the landscape. 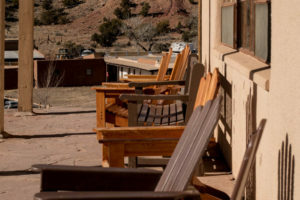 One of my favorite features of the Ghost Ranch house was the dining room table, a table of two plywood planks laid out side by side, surrounded by tall backed Chinese chairs. 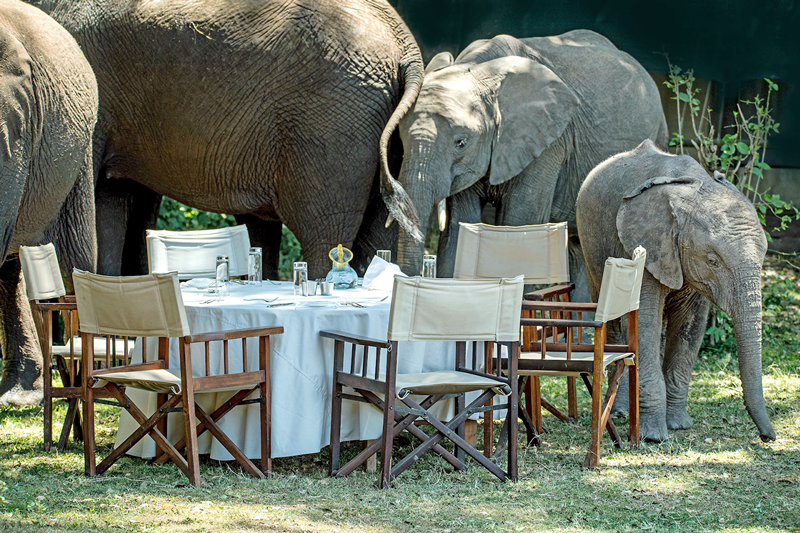 For more intimate dining, she simply placed one plank atop the other! Voila! A smaller, narrower table for conversation. 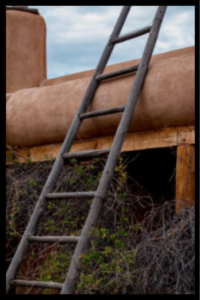 She would repeat this in her Abiquiu house, years later, when she moved in after fully renovating the property. 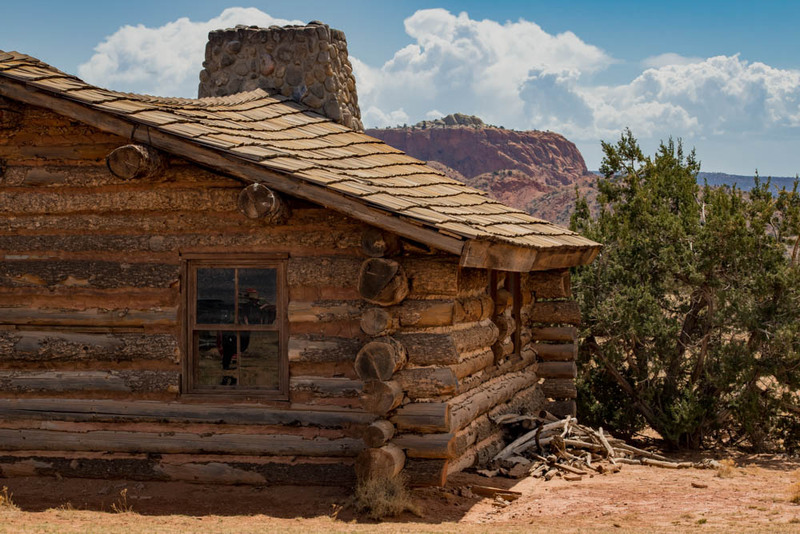 The house itself is very spare, but there are rich tales to be told. 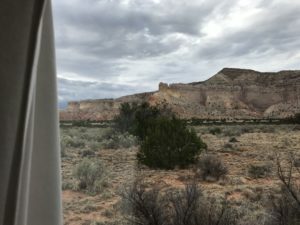 Tales of Andy Warhol writing a note on the refrigerator with a red marker; of Georgia’s favorite breakfast nook where she could watch the light spill into the canyon; of the the people who visited Ghost Ranch and Georgia O’Keeffe. The interior of the house is largely white with plain walls, simple bed linens and little furniture. Color was reserved for her paintings. 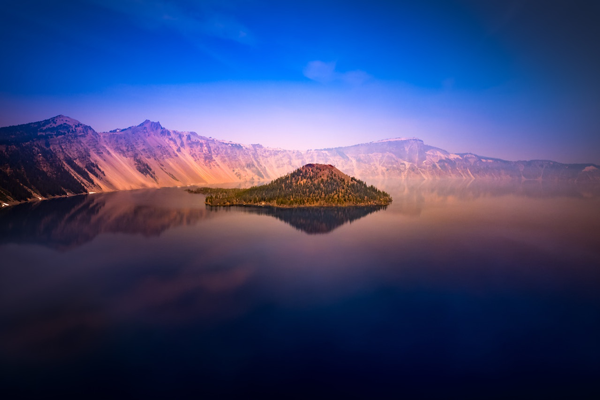 And her paintings celebrated the color and light of this landscape! Walking out through her garage is a step back in time. 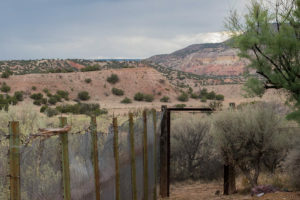 Here you could feel her presence, imagine her connection with this land, as you look out across her property at some of the scenes she made famous. 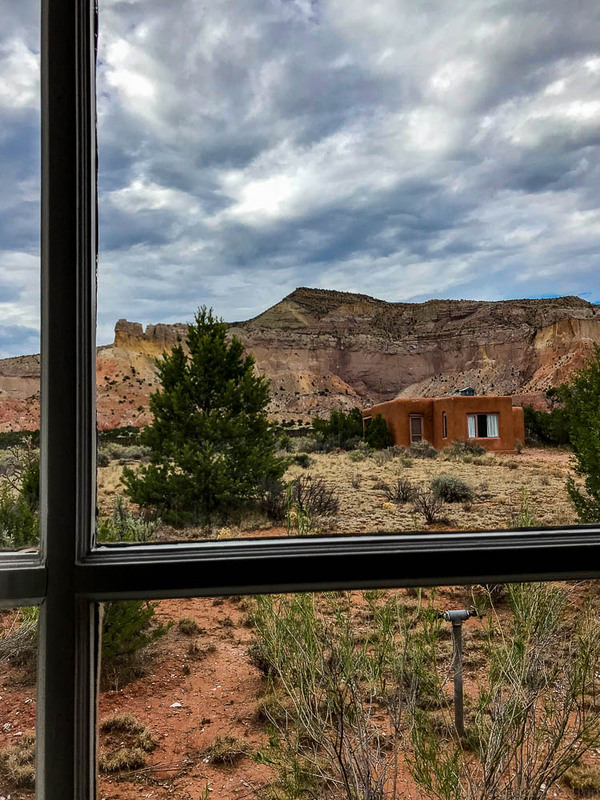 From the garage in the O’Keeffe house at Ghost Ranch, looking out across the expansive property from the garage. 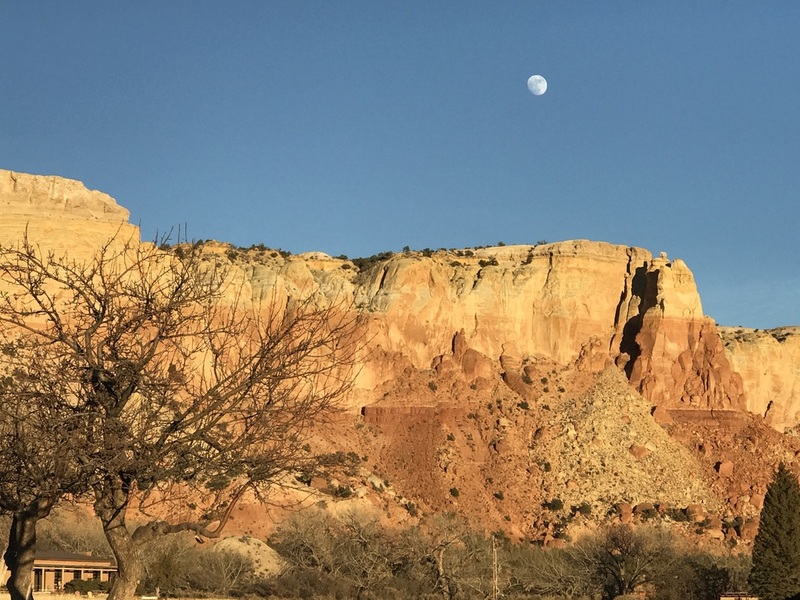 Ghost Ranch was immortalized by O’Keeffe’s work. Her paintings are rich with color, texture and suggestion. She is often referred to as the “Mother of American Modernism”. 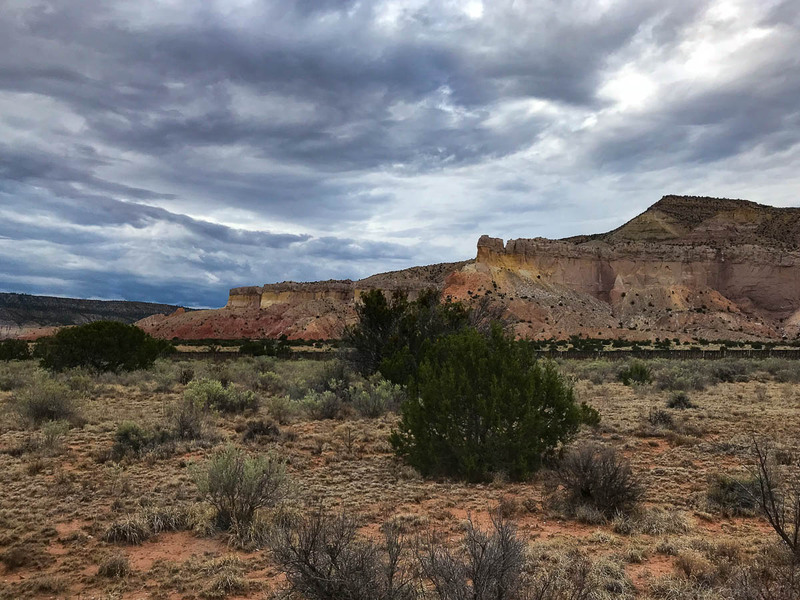 Her paintings live in that timeless place called New Mexico, where past and present mingle seemingly effortlessly together. 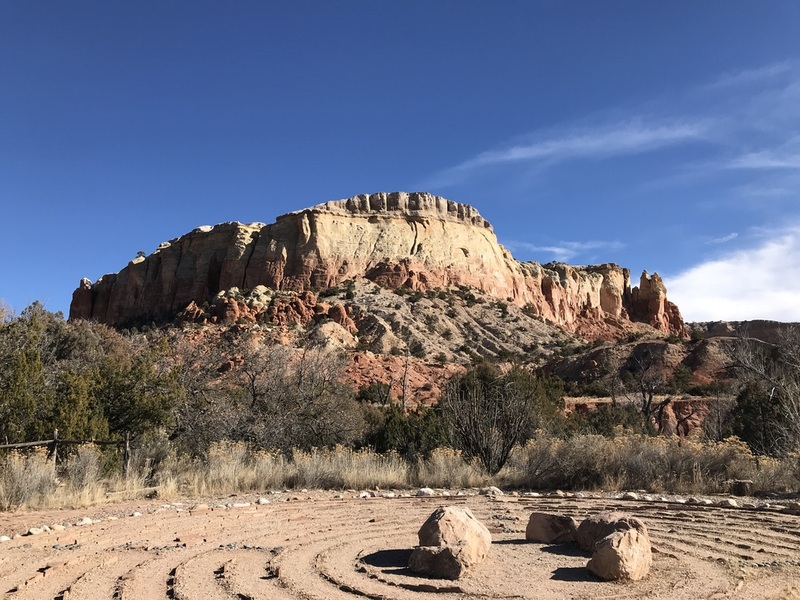 Many of her works are on display at the Georgia O’Keeffe Museum in Santa Fe, but if your schedule allows, be sure to visit Ghost Ranch. 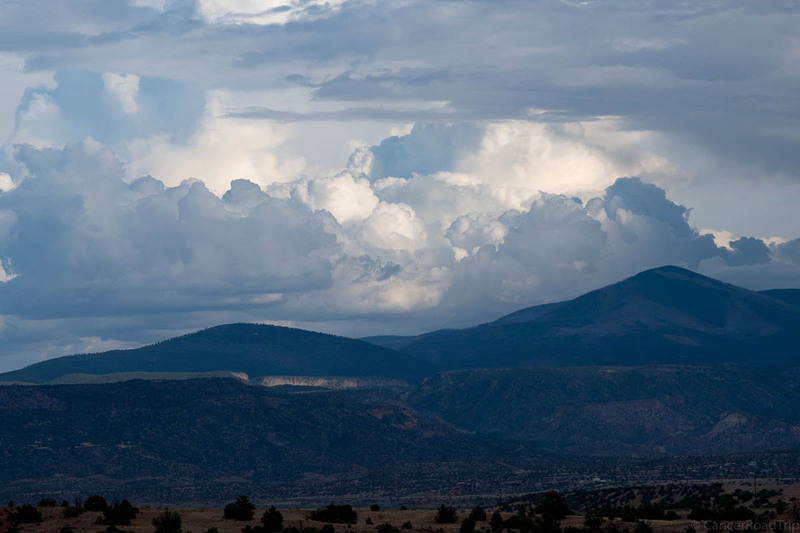 It will forever change the way you view O’Keeffe’s art and perhaps the way you view the world. 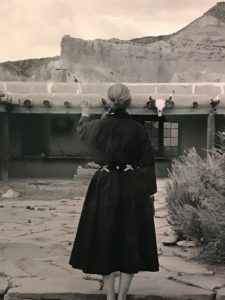 Georgia O’Keeffe’s houses in New Mexico—at Abiquiu and Ghost Ranch—are essential elements in her paintings, but their history has never before been detailed. 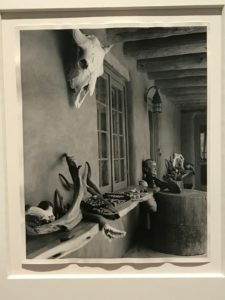 Quoting liberally from the artist’s letters, Barbara Buhler Lynes and Agapita Judy Lopez create a vibrant picture of O’Keeffe (1887–1986) and her homes, which have long intrigued the public. 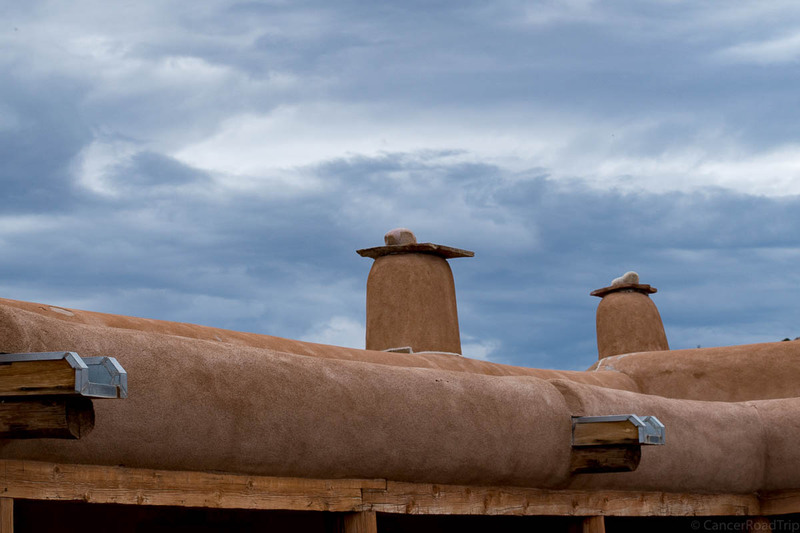 An essay by architect Beverly Spears describes the distinctive characteristics of adobe construction. This book has wonderful pictures of both properties. If you can’t actually get into the houses, this is the next best thing! Beautifully done! When Georgia O’Keeffe first visited New Mexico in 1917, she was instantly drawn to the stark beauty of its unusual architectural and landscape forms. 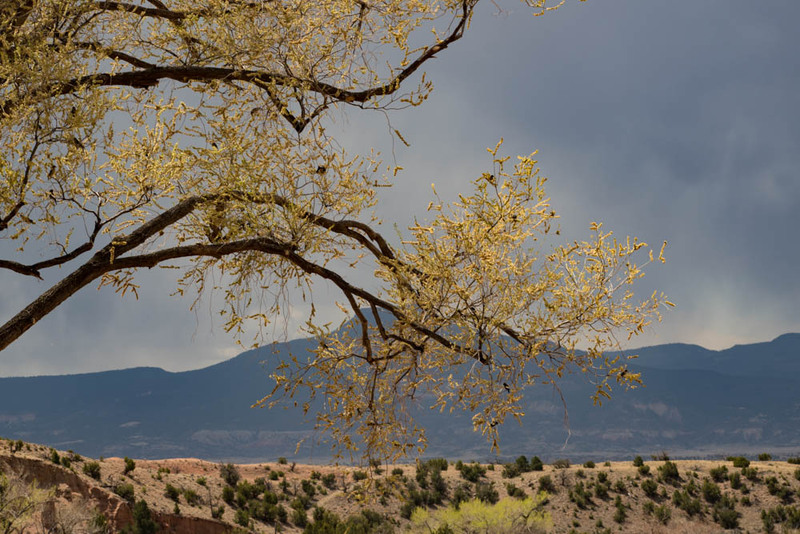 In 1929, she began spending part of almost every year painting there, first in Taos, and subsequently in and around Alcalde, Abiquiu, and Ghost Ranch, with occasional excursions to remote sites she found particularly compelling. 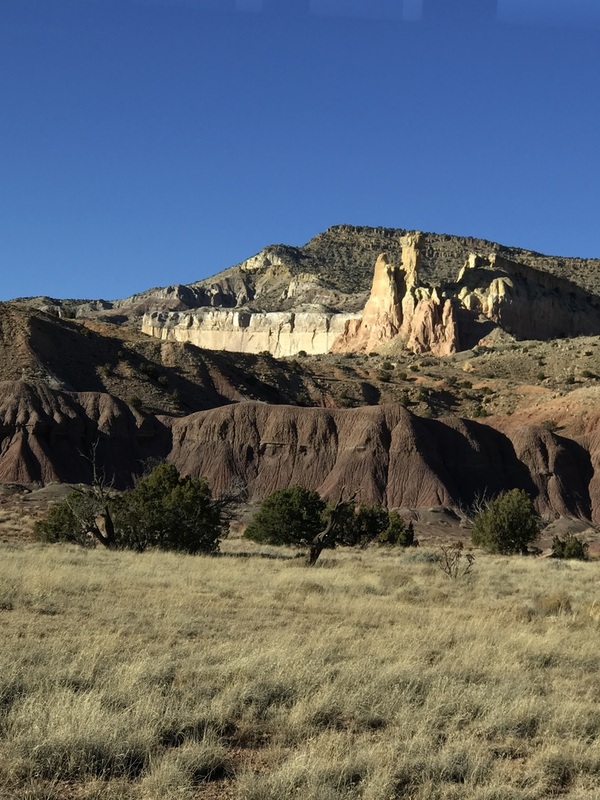 Georgia O’Keeffe and New Mexico is the first book to analyze the artist’s famous depictions of these Southwestern landscapes.